Reason sheds a light in dark places, revealing a truth where before was ignorance and the void. Art often gate-crashes the party, drinking blindly from the cup, sending a shaft of light into the shadows. Necessity is the mother to the kingdom of consciousness, that which first gave birth to philosophy. Art, the brain-child of reason, creates myth. Science, the heir apparent to reason, reveals the form. Religion, the old wet-nurse to reason, tries in vain to set the moral standards. Three centuries ago, it was a lighthouse guiding the ship out of the port. It was a brave voice in the back of our whispering collective consciousness saying when to put a sheet in the wind's eye and when to abstain from animation. It was the wasp at a party who preyed upon the priests and looked to heaven for naught. In the age of enlightenment, it was overlord and everything seemed possible. Now its time has returned! "Does a job so thoroughly busting up the party of the irrational that it's like a beating-down of the gods of modern myth. 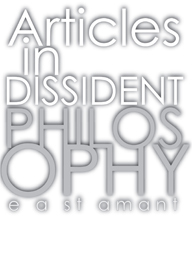 No less than a complete overthrow of all aspects of Plato and Neo-Platonism."